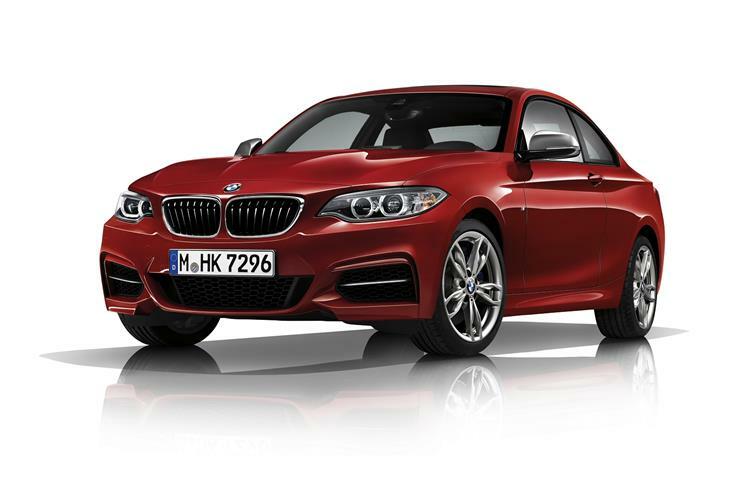 The BMW M240i is the sporting BMW coupe that flies under the radar and flies fast. Jonathan Crouch explains why. This M240i replaces BMW's previous M235i porting model, a performance orientated coupe or convertible that now features a pokier yet more efficient six cylinder petrol engine. As before, this a cracker of a driver's car that packs a 340bhp punch, is available with a choice of transmissions, is priced keenly and looks the part too. Back in 1985, BMW launched a car called the M3. There was nothing else quite like it, a racer for the road with four seats and everything Munich knew about motorsport technology plumbed into the lightweight engine beneath the bonnet. Driving it was a living, raw, involving experience - in a way that today's sharp-suited M3 can't quite duplicate, for all its extra power and sophistication. But here perhaps, is a BMW that can, the M240i. Yes, you read that right: we're ecommending the M240i here as an M3 alternative, not its pokier, pricier brother, the 370bhp M2. Don't get us wrong, we love the M2, but it's £45,000 asking price puts it uncomfortably close to M3 money. For £9,000 less, this M240i goes virtually as fast and is almost as much fun. As you may be aware, we're big fans of this model's BMW 1 Series counterpart, the M140i. And why wouldn't we be? It's hugely quick and entertaining, but BMW has gone one better with the M240i, though the 340bhp output of the improved six cylinder engine is the same. It's got a lower centre of gravity, the shock absorbers and springs are just those few degrees tauter. You'll feel the benefit when you get onto the sort of roller coaster of a back road that's all yumps, dips and successive rapid direction changes. It promises to be a better car for British roads, that's for sure. It's properly rapid too. If you specify it with the eight speed automatic transmission, it'll get to 62mph in a mere 4.6 seconds. As much as we like the latest generation of ZF self-shifters, we beseech you not to do this. Stick with three pedals and a gear stick. You might be a couple of tenths slower, but this might be one of the last properly analogue BMW sports models and you need to enjoy it as such. Press the Sport button and you'll immediately notice the steering weight up and the throttle response sharpen. Press the button once more and you'll find Sport+, which partially disengages the stability control and offers an even spikier throttle pedal. Expect to be mercilessly harassed by these cars on foreseeable UK track days. It was only when BMW pumped up the 1 Series Coupe into the brawny 1M that it started to look anything but top heavy and gawky and the 2 Series addresses most of the aesthetic shortcomings of that old coupe. It's wider and longer, losing that top hat look of its predecessor, and the roofline has more sassiness to it as well. It's by no means as sleek as a 4 Series coupe but it's no ugly duckling. In fact the chassis is a modified and slightly shorter version of the 3 Series' underpinnings and it shares its bonnet, front wings and doors with the three-door 1-series. The front end features a broad kidney grille and more aggressive air intakes. Moving back, you'll find swept up side skirts, some surprisingly low-key 18-inch alloy wheels and some Audi-like silver door mirror caps. Inside, it's much as you'd expect, with improved build quality and more substantial plastics used throughout. BMW's much-improved iDrive system features a high definition 6.5 inch flat screen. Access to the rear and legroom once you're back there is a good deal better than the 1 Series Coupe and shoulder width has also been improved. The boot is a useful 390-litres. BMW wants just over £35,000 for the M240i, which makes it one of the better performance car bargains if not quite the must-have proposition that the slightly more affordable M235i represented. Still, what else could you buy for the money that even touches its range of talents? Audi has nothing. Mercedes will sell you the CLA 45 AMG which is a hard hitter but is priced at over £42,000. Where are the M240i's coupe rivals? Truth is there aren't any. While Mercedes and Audi have become obsessed with exploring ever smaller sub-niches, they've both dropped the ball here. Just about the most plausible competitor would be a Toyota GT86 that you'd spent a few grand getting Litchfield to bolt a supercharger to, but even that would never feel as good an ownership proposition as the BMW. How inclined would you be to spend another £5,000 to buy a less powerful Porsche Cayman? Equipment runs to a Nevada leather interior, both AUX-in and USB fitments to a stereo that can play MP3s from CD, a multifunction steering wheel with a speed limiter mode, air conditioning, door sill finishers with M240i designation, a short-shift gear lever and a whole host of safety kit including DSC+ stability control, xenon headlights, a tyre pressure warning system and dynamic brake lights. That smooth ZF eight-speed automatic gearbox is offered as an option. Some magazines have compared the M240i to the old E46 M3 and it's easy to see why. They're coupes of much the same size, both feature straight six engines and power outputs healthily over 300bhp. But should you want to see how far we've progressed in a decade, consider the fact that the M3 would get emissions of 287g/km and return a fuel economy figure of 23.7mpg. Compare and contrast the M240i's numbers which are 163g/km and 39.8mpg in auto form. You might also want to bear in mind that the M3 is slower, is down a stack of torque and cost over £41,000 ten years ago. As lovely as that car was, it's clear that BMW's march of progress is wholly unsentimental. EfficientDynamics, BMW's suite of energy-saving features, is responsible for making those vaguely implausible looking figures. The M240i is fitted as standard with an Auto Start-Stop function available on both manual and automatic transmissions. An ECO PRO mode, activated using the Drive Performance Control, is a new feature on BMWs that adjusts various on-board systems to maximise efficiency. When in ECO PRO mode, the throttle response is adjusted to encourage a more economical driving style. The extra economy created in ECO PRO mode is fed back to the driver, with the in-car displays showing the additional number of miles achieved. We don't think this is too bold a prediction, but the BMW M240i looks set to continue where the old M235i variant left off as one of the most well-regarded BMW sporting models of recent times. Put simply, it barely puts a foot wrong. The price is right, it's crushingly quick, supremely efficient and it looks.. Well, it's good-looking enough that you won't need to make apologies for it when it's standing on your driveway. Most importantly, BMW has managed to combine these talents and pitch the car right into a sweet spot in the market where its key rivals from Mercedes, Audi, Porsche, Lexus and Jaguar will all simply look at each other and wonder how that just happened. If you felt that the BMW M3, and latterly the M4, had become just too powerful and expensive to be of any real relevance, you're going to adore the M240i. If you gave any BMW fan a wish list and asked them to build the perfect car given the company's current resources, it might not be too far off this one. Maybe a few grand cheaper, but you can't have everything. Even as it stands, this is the performance coupe bargain that will completely change the market. Hats off to Munich.